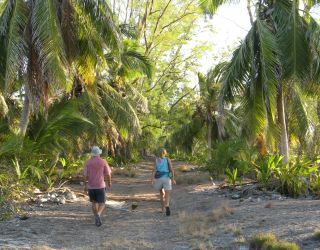 We left you last time at Farquhar Atoll, one of the southern-most of the Seychelles atolls, resting and waiting for a better weather window. Our welcome there was a bit frustrating, but not unexpected. Since we'd already checked out of the Seychelles and didn't have a permit to visit Farquhar, we weren't really allowed to go ashore. However, we managed one shore excursion before we were told, and the manager, Elvis, let us go ashore on our last day as well. In between, he plied us with lots of fresh fish and fresh vegetables, as well as his affable company, probably to assuage his embarrassment at having an assistant who makes sure he enforces silly rules. All the sillier as there wasn't much to protect - some turtles and rays, but no fish and very little coral. Even the "resort" isn't very legal, as it was built without government permission. 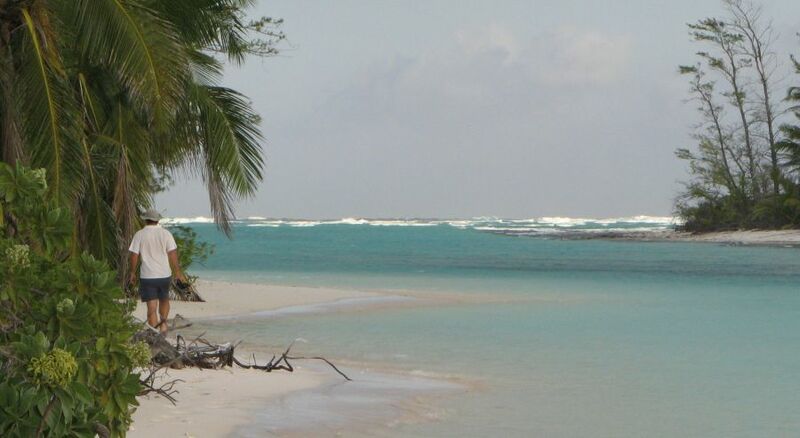 The whole atoll was pretty much flattened by a cyclone last December. Nevertheless, it was a delightful rest, and we were able to complete several maintenance tasks. But our forecast weather windows kept evaporating as they got closer. Finally, on Saturday October 6 the wind went more into the ESE so we headed out. There was lots of wind, so we quickly tucked in first one and then a second reef. Somewhat predictably, the wind piped up even more when some squalls came through at 1am last night and we had to take a third reef as well. I'm afraid this trip ranks pretty high on our yuck-O-meter. 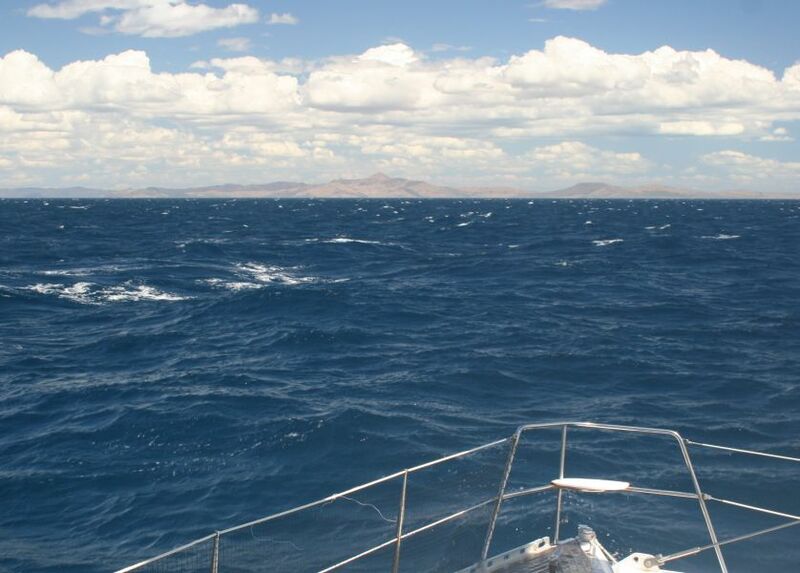 Our winds were 23‑33 knots at 40°‑60° apparent, well forward of the beam. A wave broke right beside us and sent a torrent of water cascading into the cockpit. Anytime we went outside we had to be wrapped up in our foul-weather gear as spray was coming over constantly. I suppose most day-sailors are used to this, but our passages on Ocelot have usually been dry. Despite all this, Ocelot handled it very well, shouldering along at a good clip. At 10am today we spotted the north tip of Madagascar, but the winds and currents wouldn't let us get there. 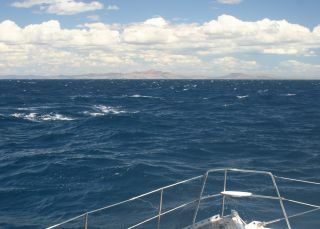 Instead, we sailed about 30 miles west of the tip, where the winds started backing around to the east, bent by the land. Then we made our way south in the flatter waters behind Madagascar, ending up in open Rantabe Bay at 12°27.5'S 48°45'E. So far, it looks pretty arid, with a few subsistence farmers in thatch huts and typically African kraals, but we've seen our first Baobab trees (Madagascar has something like 30 varieties). We'll probably rest here a day or so trying to clean the salt out of everything, but we want to be on our way south, as we have much to see, including several cruising friends. We'll send a report of whatever's newsworthy!